ZZT is a sort of action-puzzle-adventure mashup for MS-DOS, the debut title from Tim Sweeney’s Epic MegaGames in 1991. Technically obsolete before it was even released, it uses Code Page 437 for graphics, the PC speaker for sound, and has a very silly and abstract tone. ZZT is a difficult and unforgiving game that frequently tests the player’s patience, but it’s also pretty charming and mysterious. At a glance, it sort of resembles an ASCII Roguelike, or Apogee Software’s Kroz series. While Kroz uses a level-based progression, ZZT is more open-ended, with persistent screens that you can revisit. ZZT enjoyed a cult following thanks to its built-in level editor and scripting language. Any user could build their own scenarios, even with the Shareware version. The Town of ZZT is the Shareware episode, and the others could be purchased through mail-order. All of the episodes are freeware now. 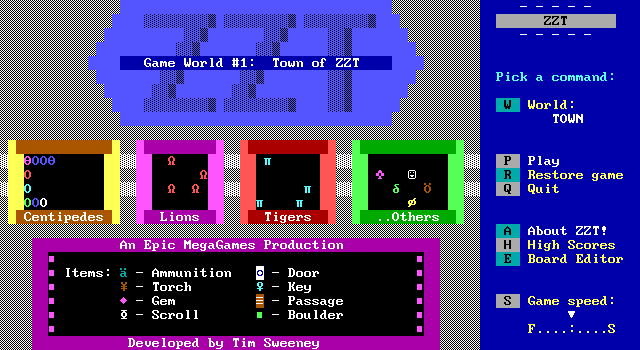 The Town of ZZT covers nearly all of the engine’s built-in functionality, and sets the tone for what to expect from other ZZT worlds. In it, you are tasked with finding several purple keys to unlock the ZZT Palace. These keys are scattered throughout the game world, and you’re free to track them down in nonlinear order. Town is a mix of simple action, mazes (sometimes dark mazes, requiring a torch), and slightly more serious block-pushing puzzles. The enemies are kind of random and difficult to shoot, but the puzzle pieces are predictable, for the most part. There are boulders that can be pushed, but not pulled; sliders that can only be moved in two directions; pushers that shove anything in their way forward, and several other single-cell game pieces that can be combined together into fragile puzzles that necessitate a quit-and-reload if you mess them up. Town is very unforgiving, and the expectation is that you are making new save files whenever you feel even remotely at risk of losing. There is not really any town in the Town of ZZT. Puzzles and action sequences are just there, because why not? Your reward for breaking into the ZZT Palace is … more ZZT. If and when you make it to the end, the game acknowledges your victory, and that’s pretty much that. As for the other episodes, they are very much in the same vein. Dungeons of ZZT is a little heavier on action, Caves uses many dark areas and has some tougher slider puzzles, and City feels a little more like an adventure game (just a little), with increased emphasis on NPC interaction and some more object scripting. In the modern day, how does one take advantage of this opportunity for adventure, puzzles, savescumming and swearing? Archive.org Browser-Based Emulator — This is probably the easiest way to play ZZT right now. Just click the link, and voila. All of the original episodes are packed together, and you can find a plethora of other ZZT world files by searching Archive.org. The main downside is that your save files might not persist between browser sessions. Just a heads up: the volume of DOSBox’s simulated PC Speaker is very loud by default. To make input more responsive, you can increase the default CPU cycles from 3000 to about 10000 — use CTRL+F11 and CTRL+F12 to adjust on the fly. Cycle count is shown in the title bar. 0.74 has an issue with keyboard input, where releasing one key will cause all keyboard keys to be released. This makes navigating around corners difficult. Other DOS games affected include Betrayal at Krondor. DOSBox Daum doesn’t have this problem. You can toggle aspect correction straight from the menu, so you can view games from the era of 4:3 CRT monitors a little more like they would have looked at the time. You can then turn this off if it’s making things hard to see. You can maximize the window, and toggling fullscreen mode also appears to be faster than plain 0.74. Native MS-DOS or 32-Bit Windows – The most authentic, but least practical solution. The last systems capable of running ZZT directly were 32-bit Windows machines (and even they use an emulator behind the scenes). Also, two ZZT supersets / emulators now exist: Chris Allen’s ZZT Ultra and SaxxonPike’s Lyon. I haven’t dug into them much yet, but they look promising. I started writing some reviews of ZZT games here, but my ZZT nostalgia binge is drawing to a close for now, not to be recharged for another few years. The list I was working on had significant overlap with existing recommendations on the web, so I’m going to take the easy way out and just link to those instead. Anna Anthropy’s ZZT Recommended Reading list. Anna also wrote a book about ZZT. As mentioned above, most ZZT games have been uploaded to Archive.org, and can be played directly within your browser. Just go to Archive.org, and search for the game’s title, plus ZZT. If the games lag in your browser, try hitting CTRL+F12 to increase the speed of the emulated CPU. If they still lag, you can download the games from the same page, run them in DOSBox, and try hammering CTRL+F12 again. Worlds of ZZT is a social media preservation effort by Dr. Dos. Follow the worldsofzzt Twitter bot to pepper your feed with randomly-selected ZZT game screenshots.